It is beautiful color in lovely shape, can holds 1 stick of softened butter, great for a family of 4 and simple to use. It is also an elegant decoration on the dinner table for home or party. 1. According to the water level, pouring approximately 1/2 inch of water in the basin. 3. Put the butter lip down into the crock upside down! 4. Keep the butter crock in a cool place to prevent the butter drops from the top of the lip. Things to know and frequently asked questions. 1. Why does the butter stay in the Butter Keeper lid? The butter is held in by the surface tension. That is why the butter needs to be packed into the lid. It does not fall out is to pack it in really tight. 2. How much water and how often do I need to change? According to the water level, pouring approximately 1/2 inch of water in the basin. The water should be changed every 2-3 days, cold water will be better. 3. My butter is falling into the base, why? The butter will fall out if it is not packed well. It needs to touch the sides with no spaces or gaps. Besides, when the temperature approaches 80℉(27℃), the butter will become to soft to stay in the lid. You need to keep the butter crock in a cool place or add ice to the water in the base. 4. When butter gets low (e.g. to 1/3 or less) would it goes rancid? It's still reducing the exposure of the butter to air. The time of keeping fresh is still more longer than other traditional butter dish. 5. Is the Butter Keeper easy to clean? Yes, the Butter Keeper Crock is dishwasher safe. If needed, clean by hand with hot water and dishwashing liquid. FRESH & SOFT BUTTER READY AT HAND AT ALL TIMES - No more cold butter from fridge! This crock keeps your butter soft and spreadable for use on rolls, bread, toast, waffles, pancakes and more, without having a gooey mess on a plate somewhere. Enjoy room temperature butter in the morning! EASY TO USE & EASY TO WASH - The crock comes with a fill line on the inside for water that makes an airtight seal, no more guessing. It requires minimal care, and it washes well in the dishwasher. (top rack) Change water each day or every 2-3 days. Keeps butter fresh for a month. For more about how to use it, check out the detailed description on this page. ADEQUATE CAPACITY FOR MOST FAMILIES - The bell holds about 1 and 1/3 stick of soft butter, it depends on how you press it, technically the maximum is 1 and 1/2 stick of soft butter, it is extremely practical for your family. Get 2 units if you have a big family. 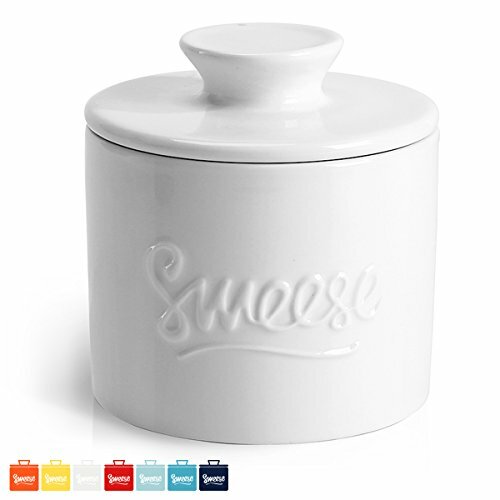 PRO-GRADE PORCELAIN & GORGEOUS COLOR - The Sweese butter crock is made of durable professional grade porcelain - a type of premium LEAD-FREE and NON-TOXIC ceramic, chip-resistant and more sturdy than stoneware, dishwasher safe. It is well made and beautifully finished with gorgeous color - an attractive addition to the kitchen or table. 30 DAY NO-CHIP WARRANTY - Your purchase is backed by our exclusive 30-day No-Chip warranty - Sweese will offer a free replacement or refund if anything goes wrong with the product. That's ZERO risk! If you have any questions about this product by Sweese, contact us by completing and submitting the form below. If you are looking for a specif part number, please include it with your message.